Experience the glorious rich-colour immersion of the 4K HDR picture with Samsung's MU7000. 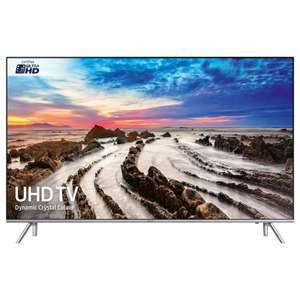 Stunningly clear 4K Ultra HD resolution combines with HDR 1000 to achieve staggering levels of detail, brightness and contrast. Samsung's Dynamic Crystal Colour tech injects all your content with beautifully lifelike colour, while Precision Black achieves the same level of clarity in the darkest shades. Access a world of online entertainment via Samsung's Smart Hub, and control all compatible devices via one remote control. With elegant 360 design, this set will revolutionise your home entertainment. Samsung are one of the forerunners of colour-boosting High Dynamic Range (HDR). As members of the UHD Alliance, they've engineered HDR 1000, indicating up to 1000 nits of shimmering brightness, to give a glorious glow that will knock your socks off. Usually, studios are forced to dilute the colour of their shows and films to fit on our TVs. Now, HDR screens like the MU7000 can channel content from studio-to-living room with the same precision and utterly otherworldly hues. HDR 1000 achieves exceptional brightness, shadow detail and vibrant colour. It's heightened further by their Dynamic Crystal Colour technology. This tech delivers over a billion hues, 64 times more than conventional UHD. This makes shades sharper, the image deeper, and colours crystal-clear and lifelike. Plus the screen's UHD Dimming achieves more realistic shadow detail and contrast too. Being able to independently adjust tone, brightness and sharpness in different areas around the screen gives a stunningly realistic picture quality. The MU7000's Certified Ultra HD 4K resolution screen takes you to the next level of viewing experience. Four times the number of pixels of 1080p Full HD delivers stunning realism, natural motion and incredible detail. Experience this high-spec picture on everything you watch thanks to 4K upscaling. Samsung's innovative upscaling technology converts lower resolution content to a level of detail near UHD. Upscaling is a process through which a lower resolution signal or data source is displayed at a higher resolution. The upscaling process interpolates additional pixels from the source data, and produces a clearer picture on your 4K screen than a non-upscaled image. Meanwhile the brand's Supreme Motion, combining stunning image-processing speeds, backlight technology and a super fast frame rate, ensures even the very fastest action is of the highest clarity and judder-free. Precision Black technology ensures there is just as much stunning detail in the dark, shadowy scenes. Stunning levels of contrast mean the deepest, dark blacks are equally delivered alongside such amazing levels of beautiful brightness. Minimalistic silver 360 Design looks stunning from any angle, with a clean back panel, for an eye-catching look that enhances any viewing setting. In keeping with the elegant aesthetic, connecting cables run down through legs of the stand, removing unsightly clutter from your living room and complementing a supremely refined look. TV Sound Connect: Effortlessly connect a Samsung soundbar to your TV with Soundconnect. Samsung are offering a 10 year screen burn warranty to all customers. This way, you’re covered – no matter what. Just register your TV here after you’ve set it up. RGB Direct were selling this for £649 with 5 year warranty last week - though unsure if they still are. Richer Sounds seemed happy to match and beat by £10 to £639 with 6 year warranty and John Lewis also happy to match (RGB) at £649 with a 5 year warranty. I got mine from Richer’s sounds on Monday for £649 they priced matched and got the 6 years warranty. I got mine from Richer’s sounds on Monday for £649 they priced matched and …I got mine from Richer’s sounds on Monday for £649 they priced matched and got the 6 years warranty. What do you think of the TV ? I heard these arnt that good, how do the N 2018 range compare? You heard wrong, these are probably the best midrange TVs you can buy. Especially for £649. Is anyone else having problems buying with the BNPL? Every time I hit the button it puts in a different code and says it's not eligible. Deal posting newbie! This is andyjst first deal post. Help out by leaving a posting tip or just to show your appreciation for their contribution.